Does Your Worship Team Lack Commitment? Here's Why. Does Your Worship Team Lack Commitment? Here’s Why. Do members on your worship team show up late for practice, unprepared or cancel at the last minute? Whatever the issue is, an uncommitted team member is extremely frustrating. They tend to make the entire team inefficient and unproductive. It is easy to carry resentment towards those who seem uncommitted and blame the problem solely on them. However, I have found that at least part of the problem falls on the worship leader. It is much like marriage – rarely is a marital problem the result of one person’s actions. Both parties have contributed their fair share. Considering you cannot change someone else, lets talk about what you can change: you. Following are several things that I have found that lead to an uncommitted team. Lack of commitment often stems from unproductive rehearsals. Time is our most valuable asset in life. We only get a set amount, and there is no getting it back once it’s gone. Although we don’t always treat it with the respect it deserves, we tend to resent those who waste our time. If the team leaves rehearsal feeling like nothing was accomplished, their time has been wasted. Instead, they could have spent time with their family, relaxing or doing something else – but, there is no going back. Most will forgive an unproductive rehearsal here and there, but when it is a frequent occurrence, an attitude will rise up that looks a lot like a lack of commitment. 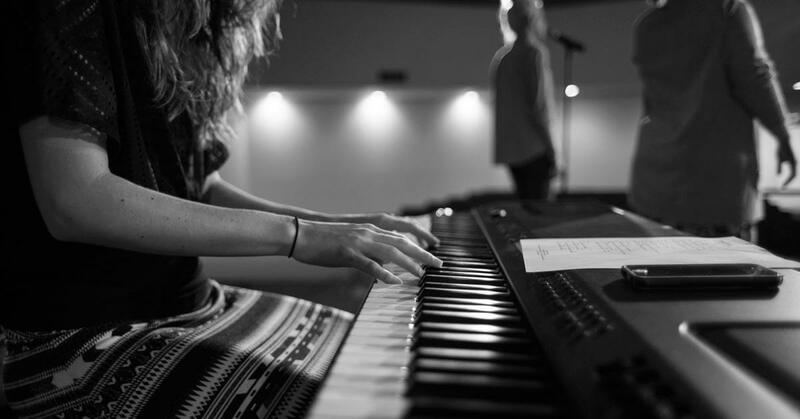 As a worship leader, you must communicate your expectations again and again and again. You know what they say about assuming…it makes a fool out of both parties involved. Showing up to rehearsal on time may seem like common sense to you, but someone else may not understand its value. Coming to rehearsal prepared may also seem like something everyone should understand, but your musician may feel that volunteering only requires showing up to rehearsal, not practicing on their own time. Bottom line, it is best not to assume anything. Simply communicate your expectations as if they had no idea. It is also important not to make a worship team member feel inadequate because they do not see eye-to-eye with you at first. Explain your expectations in a respectful manner. Then, when they fail to meet them, explain them again in a respectful manner. Most leaders are extremely committed people – which is what makes them a leader in the first place. They expect the same thing out of their time that they expect from themselves. Although there is nothing wrong with high expectations, it is important to take a step back, putting yourself in their shoes. Then, be realistic. The goal is to find a place that pushes them to grow but doesn’t stress them out. You want them to enjoy what their doing while they are growing. For example, there are worship team members who want to be involved every week, but others may not feel the same way. It is quite possible that the pressure of playing every week is just too much. If you listen, those who don’t want to be involved every week will let you know in a round about way. Whether you have a back up for this person or not, you need to find a way to give them a week off here and there. A desperate worship leader will run off each worship team member one-by-one. Can the worship team sense desperation? Maybe you only have one musician for each part and it scares you to think that someone might leave the church or go on vacation for a few weeks. And you are right, both of these things will happen at some point in the future. I am reminded of Philippians 4:6-7: Don’t worry about anything; instead, pray about everything. Tell God what you need, and thank him for all he has done. Then you will experience God’s peace, which exceeds anything we can understand. His peace will guard your hearts and minds as you live in Christ Jesus. You have to make a choice to live by this scripture. Regardless of what happens, cling to this peace that surpasses all understanding. Don’t get stuck in the belief that a full band is required for the Holy Spirit to move in a service. Relax… and work with what you have because a desperate and anxious leader leads to an uncommitted, unhealthy team. You might also enjoy: Is Your Worship Team Afraid to Take Time Off? Great article!! It really makes me take a step back and evaluate myself as the leader, especially “demanding too much”. A member of my team says he “hates guitar”. However, often he is seen playing it or just messing around on it, so it doesn’t seem like he hates it. However, he is mandated to be a part of the worship team, as his father is one of the pastors. I usually carry the worship team, as I’m the most experienced player we have. However, currently, my work schedule does not allow me to be at church during service. I’ve asked him several times if he is going to practice and he says, “Nope.” “Why not?”, I’ll ask. He’ll reply, “’cause I hate guitar.” This past Sunday I heard from the pastor “_______, butchered worship!” After hearing that, I asked this individual if he was going to practice so that doesn’t happen, again. His reply, “Nope.” I told his dad and his dad grounded him. When I sit down and talk to him, he says he wants to sound good while playing but he doesn’t want to practice and he just enjoys being on stage with the rest of the team. So, what should I do or how should I approach this issue?? You are in a tough situation, no doubt. Honestly, in this situation, I would have the guitar player to step down. When someone who is on the worship team only cares about being ‘in the spotlight’ and doesn’t put in the time required to be an asset to the team, their participation is more detrimental to the team than helpful. An attitude like this spreads like an infectious disease. With this being the pastor’s son, a whole new dynamic is introduced. So, you will probably want to have a heart-to-heart with the pastor, explaining how this type of attitude only hinders the worship team. Maybe the kid should sit out for 6 months or so, then give him another chance. Thank you very much for your blogs, this one in particular hits home in many ways. I am not an official Worship leader so to say. Our Pastor who is in charge leads every other Sunday and I switch with him leading. He has given me more responsibility little by little since when I first started on the band(wasn’t leading at all). So on the weeks that I do lead I’m basically in charge. We have a small church around 100-150 people. And our band is the same rotation every week except when I lead pastor doesn’t play. And we rotate Drummers, everyone else plays because that pretty much the whole band and who’s available. I do my part As a leader when it’s my turn. I’m also practicing during the week[when leading or not], or even just playing around or adjusting my sound on my set up at home. And literally everyday I’m always listening to music, sometimes for fun, sometimes worshiping, or just I general. So I’m all about being committed. So to the point: I usually send the list out a week in advance to give the band time to prep, listen and practice to he songs, ect. Reason being is that we are ONLY[as of now] able to practice as a band early Sunday morning well before service. So I always send the list out and encouragingly suggest the team to make sure to practice, listen, and familiarize with the songs throughout the week to be prepared. There are times too often where I know/can tell that they don’t practice or learn, or kind of just wing it. It’s hard to say anything( even a respectful manner) with out it being taken a different way, or in a serious way. I know nobody can be forced to have the Desire to practice/play/worship, and I wouldn’t even try to. Because it all has to come from the heart. A couple of them were put in this responsibility of being the band because they were all that’s available way back when, and at times I feel that they may feel that they’re just going through the motions or feel like they’re the only option. So they continue at times to be stagnet. Or lack the drive to grow musically NOT spiritually, I know the desire for the spiritual aspect is there. They and myself at times rely to much on krutches(music sheets, ect) from time to time. We are a spirit filled church and strongly believe in relying on the Holy Spirit and God to take control and use us throught the service. Along with that though, I say that it goes hand in hand with making sure to do OUR parts to practice and learn the songs. Faith without action is meaningless in that sense. What’s a good way of motivating and getting the point across to getting the group to be more comitted or putting more of an effort? With out making it seem like I’m being too forceful or nagging. Even speaking in an appropriate tone. Hey Andrew – thanks for the comment. Motivating the team starts with open communication – which is going to be uncomfortable no matter how or what you say. So, approach it with love but be bold at the same time. They need to understand why it is important to come prepare (i.e. an unprepared team can really hinder what God wants to do in the service). Although it doesn’t sound like your worship team members are being ‘difficult’, there is a strategy in this post that will help walk you through some of the communication that needs to happen. It sounds elementary and obvious, but I think you should have emphasized one thing, perhaps as part of the “unproductive rehearsal” section. If I’m not prepared in every way, how can I expect those who follow me to be prepared? Again, it may sound obvious, but believe me when I tell you, it’s not. I’ve been a part of too many rehearsals where the WL is figuring it out on the fly. That does nothing but frustrate the team members, especially when they are the ones who are prepared. When I became a full-time WL four years ago, I vowed I would always be prepared to such a degree that the team could count on my lead. For the most part, that’s been true, and I’m blessed to have a band that follows my lead. And it’s interesting … the very few times that life (read: the rest of my job in ministry) has gotten in the way and I wasn’t as prepared as normal — those are the worst rehearsals I’ve ever led. Not because of the team, but because of me. Gotta be prepared. If you set that example, others will follow. Once that happens, peer pressure is a heck of an effective tool. Totally agree. Good word, Bob. Our church has Sunday morning and Sunday night services and have a rotation roster. Is it too much to require worship team members to attend the service they are not singing at? With the exception of vacations, sickness, etc. One team member missed 6 out of a total of 12 Sunday services and left early on two of the ones that were attended. The reasons were; daughters birthday, fathers birthday, visiting parents in another state, sickness one week, vacation the next. I’m a stickler for coming to church and I’m having a hard time knowing how to deal with this issue correctly. If it were me and knew vacation was coming, I’d. It have the birthday party on Sunday. But I’m afraid I’m being a little demanding. Hey Rebekah – I am not sure there is a right or wrong answer here. What’s important is that your expectations are continually communicated so the team isn’t blindsided when you have a conversation with them about not meeting the expectations. Personally, I would not require them to be at the extra service if they were not scheduled to play. But, just because you do doesn’t mean you are wrong. We all have different convictions and preferences. Let the Lord speak to you as to if you need to lighten up your expectations or continue on.